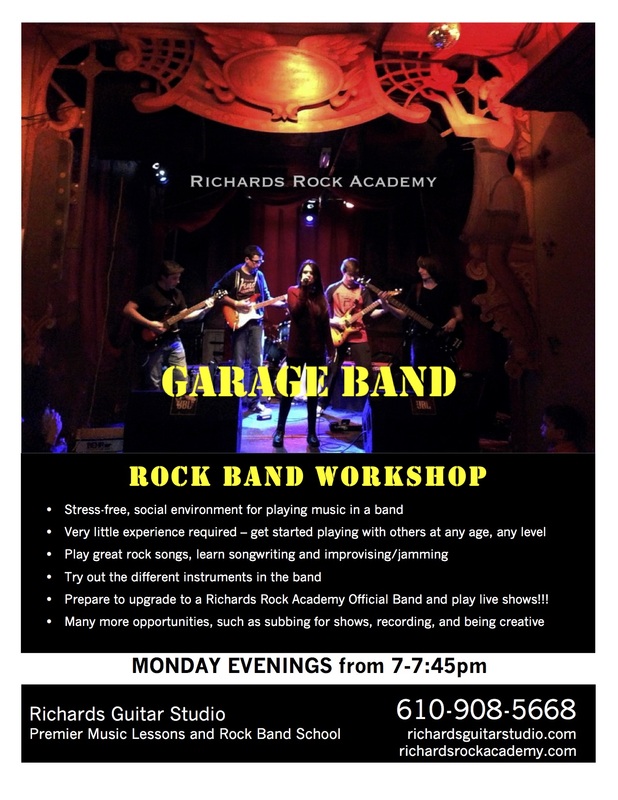 Join our Garage Band class at Richards Rock Academy! A great beginner/intermediate class for learning to play in a band, and having a blast jamming with other students! Low-pressure environment and no live-shows requirement. For more information or to reserve a seat, email us HERE or call 610-908-5668. Nate shows you a variation on a great John Petrucci warm up exercise from the book Rock Discipline. This exercise focuses on string skipping, alternate picking, stretch, finger independence, and finger dexterity control. If you only have a few minutes to warm up before playing guitar, this is a great choice for a warm up as it hits so many different areas of fret hand and pick hand technique all at once. Start by learning the fret hand tabs, and use downstrokes only until you get the hang of it – then incorporate the alternate picking. The fret hand pattern is confusing enough that trying to incorporate everything at once might be a bit overwhelming. Get the fret hand down first, and then work in the alternate picking. Use the least amount of movement possible. Stretch the fingers across the fretboard, in a horizontal motion, rather than using the entire arm to reach the frets. Feel how each finger stretches, and the unique sensation of each of the fingers as you move them. Each of the four fingers has a different response to being stretched, as well as being moved independently of the other fingers. Get used to how each finger feels. Do the ascending pattern first – only do the descending pattern once you get the idea. Do this drill one small chunk at a time. Since there is so much going on at once, it is not necessary to shred the entire thing right away, as fast as you can, and in complete performance mode. Just a little bit at a time will do, as there is much value in each small pattern. Check out www.richardsrockacademy.com for our rock band school information, news, events, etc. Serving Delaware County, PA and surrounding cities such as Glen Mills, Media, Swarthmore, Wallingford, and Ridley PA.
Richards Rock Academy at Barnaby’s Ridley! October 27, 2015 / Richards Guitar Studio / Comments Off on Richards Rock Academy at Barnaby’s Ridley! Read about Richards Rock Academy performance at the Pumpkin Express festivities at Barnaby’s in Ridley, PA. Here’s a video of Stix N Pix Crazy Train by Ozzy Osbourne and Sweet Child O Mine by Guns N Roses. Here is a middle-of-the-night candid talk about WHY we teach the Rock Guitar Mastery Program and why it is so important to our mission at RGS. You WILL NOT find a team of teachers who think long-term like we do, and put such a value on music regarding it’s impact on quality of life. Guitar lessons are more than just an after-school activity. Learning music in an effective and high-quality way can CHANGE SOMEONE’S LIFE. In my life, my ability to make great music has been a huge positive influence, and has helped me cope with many trials and tribulations along the way. Music can be a deep, healthy, meditative way to explore the imagination, and become a friend to you – helping yourself and loved ones through times of trouble as well as times of celebration and joy. Richards Guitar Studio provides professional guitar, drum, and bass lessons and rock band school in Aston, PA. Serving Delaware County – Media, Swarthmore, Springfield, Ridley, Garnet Valley, and Wallingford. The fret-hand index finger should lay flat across the strings like a bar (but don’t press hard) to keep the strings muted. You’ll use the side of the finger tip to press down the string – NOT the direct tip of the finger. So, your tip-joint should be slightly curved but NOT curled and standing up straight. Practice rest strokes with the pick. When playing a power chord, the pick should cut into the strings in a downward motion and land on the next silent string. For example, when playing a power chord on the low E and A strings (strings 6 and 5), the pick should cut through and land on the D string (4th string). When strumming fast chords, this might not happen exactly every time, but training the follow through in that manner will result in full, powerful-sounding chords. When playing octaves, be sure to dampen the string in between. Since you skip a string when playing an octave, make sure the pad of the index finger dampens the string in between, but also check if there is too much pressure and a note is sounding. Nate from Richards Guitar Studio and Richards Rock Academy shows you how to play All the Small Things on guitar by Blink 182. Learn the power chords, strumming, and octave riffs using the guitar tabs and the video.